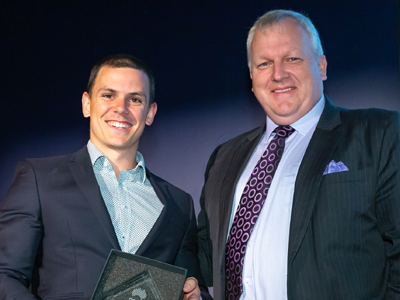 Winner of the DMTC Early Career Research award, Brodie McDonald with DMTC CEO Mark Hodge. Brodie, who is in the final stages of his PhD at RMIT University, works in DST's Land Vehicle Survivability group. As part of his PhD, which is funded and supported by DMTC, he is exploring how the different properties of armour materials, such as strength or toughness translate to performance under blast loading. Already regarded as an expert in his field, Brodie has travelled around the world to present his research, presenting at conferences in Norway, France, The Netherlands, the UK and around Australia. A key outcome of his work will be the development of a predictive framework to identify the optimal materials to use in the armour systems of ADF land vehicles, maximising the survivability of both the vehicle and its occupants. The Early Career Research award is awarded to young and aspiring technical officers, engineers or scientists who have gone 'above and beyond' in their support of a DMTC project. Brodie was presented with the award at the annual DMTC Awards in Canberra.